"The Object of Sculpture" features selected works from the post war period to present, inclusive of decorative arts, ceramics, and sculpture. The curated collection broadens the concept and relativity of the dimension of sculpture through various forms, mediums, materials, and techniques. Featuring works by Berto Lardera, Forest Myers, François Stahly, Jim Cole, Terence Main, Anne Barrès, André Bloc, Sylvain Contini, Louis Durot, Roger Féraud, François Guéneau, Philippe Hiquily, Kilar, and Pierre Székely, the exhibition emphasizes the transcendence from sculpture (early part of the Twentieth Century), as purely representational art to a non-representational artform. "The Object of Sculpture" focuses on Twentieth Century Design as a vehicle of expression for artists who engaged in an innovative discourse and creation of nonfigurative forms illustrating sculpture as three dimensional art. 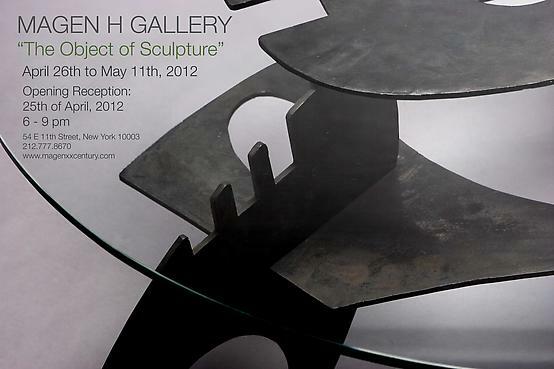 For over ten years, Magen H Gallery has been at the forefront of modern design. With special emphasis given to French post war designers, architects, and sculptors the gallery's premise is built on the foundation that art and craft are allied and interdependent. Magen H Gallery exhibits annually at Design Miami and the gallery's New York location.